ALLEVIATES EYE-STRAIN: Add a subtle backlight to reduce visual fatigue caused by different scenes and scenes in movies, TV shows and games. EASY INSTALLATION: 4 segments of a 16-inch long strip of light that make the installation easier. The adhesives of 3M are attached to almost any surface. (note: before installing, make sure the back of the TV or computer is not dusty, so you don't fall off.). QUALITY ASSURANCE: High brightness 30LED lights will last at least 80,000 hours. 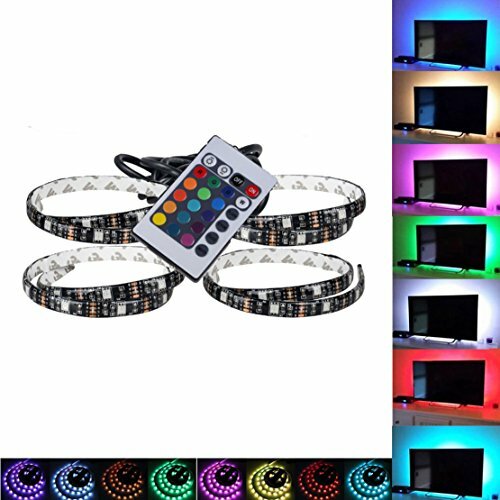 REMOTE CONTROL: You can use the remote control to control 16 colors and 4 different light control functions. SERVICE GUARANTEE: Any questions about the product can contact us at any time. Our customer service team will help you solve it within 24 hours. If you have any questions about this product by Hmore, contact us by completing and submitting the form below. If you are looking for a specif part number, please include it with your message.